A good way of obtaining a large number of plants at a lower cost is to buy them through mail order. This has advantages as well as disadvantages. Mail-order suppliers normally offer a much greater choice of plants than a single retailer can stock at any one time, and certain species may be easier to obtain. However, because you are not able to select specimens personally, and as the plants may be in transit for a few days, some of them may not be as good in quality as those from a reputable retailer. You can overcome this problem by ordering more plants than you need and selecting only the best for the aquarium. The additional cost is normally small and compares favorably with buying fewer plants from a retailer. If you have the space, introduce a number of plants into the aquarium and after a few weeks remove any that do not do well. 2 Some lead weights are lined with sponge to protect the delicate stems. When the weight has been removed, you may find that the bunch consists of several individual plants; plant each one separately. those used for transporting fish). The bags should be filled with air and tightly sealed. As long as some moisture is retained in the bags, the plants will not dry out. Filling the bags with air provides cushioning, which helps to prevent damage by crushing during transport. If you are dealing with large numbers of plants, wrap them in layers of damp newspaper and transport them in a sealed container or polystyrene box. Most plants can recover following 24 hours or more in transit. The changes in light, temperature, and water conditions will be damaging, although the effects may not become evident for a number of days. In a new environment that provides good lighting, nutrients, and available C02, the majority of new plants will quickly become established and begin to grow. There are a few points to bear in mind before you put any plants into the aquarium. To begin with, the substrate and decor (rocks, wood, etc.) should already be in place, as well as the filtration, lighting, and heating equipment. Secondly, although most plants should be snail-free, you should examine the leaves and stems thoroughly for both snails and snail eggs. 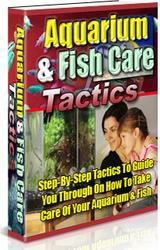 It is possible to "dip" plants in a proprietary treatment to kill any snails and/or their eggs (see pages 92-93). Make sure the roots are healthy (see page 49) and remove any damaged leaves and/or stems, as these are unlikely to recover. Removing the leaves should encourage new growth. 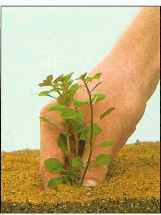 Planting methods vary according to the type of plant and its root structure, but a good planting technique should always aim to minimize damage and encourage new and uninhibited growth. Planting vallisneria at least 1 in (2.5 cm) into the substrate. The plant will produce roots from the nodes where the lower leaves were removed, so make sure that these are also just beneath the substrate. Plants supplied in pots are likely to have a much more developed root structure and may establish more quickly. Most potted plants are rooted in an inert medium called rock wool, which can be left on the plant or removed. However, in either case, you should remove the pot before planting. Leaving it in place may restrict or alter root growth, and seeing the pot rims above the substrate is not aesthetically pleasing. If there is a large amount of root growth, cut it back as described for bunched plants to minimize damage during planting. Place the plants in the substrate in much the same way as you would a terrestrial plant. First create a dip in the substrate, place the plant into it, cover it with more substrate, and apply a little pressure to ensure that it is firmly in place. Close up any gaps around the plant roots. Vallisneria creates height at the back of the aquarium. 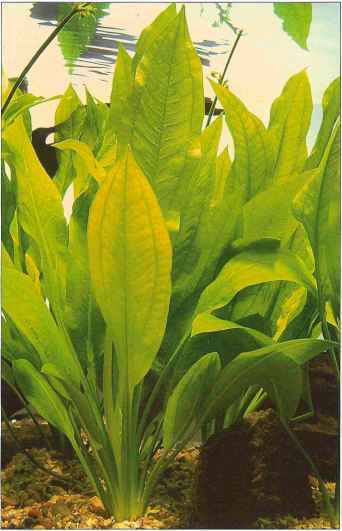 The straplike leaves are quite tough and will not be damaged by the gentle flow from a filter. Before planting, check each plant and remove any brown leaves. Remove the lead weight. Do not be tempted to plant the slim plants in one clump. 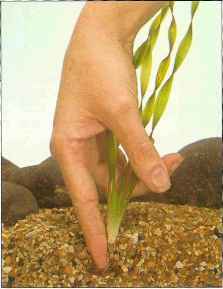 Right: Gently hold the plant near the base and, using a finger of the same hand, make a hole in the substrate. Slide the plant into the hole, just deep enough to prevent it from coming loose. 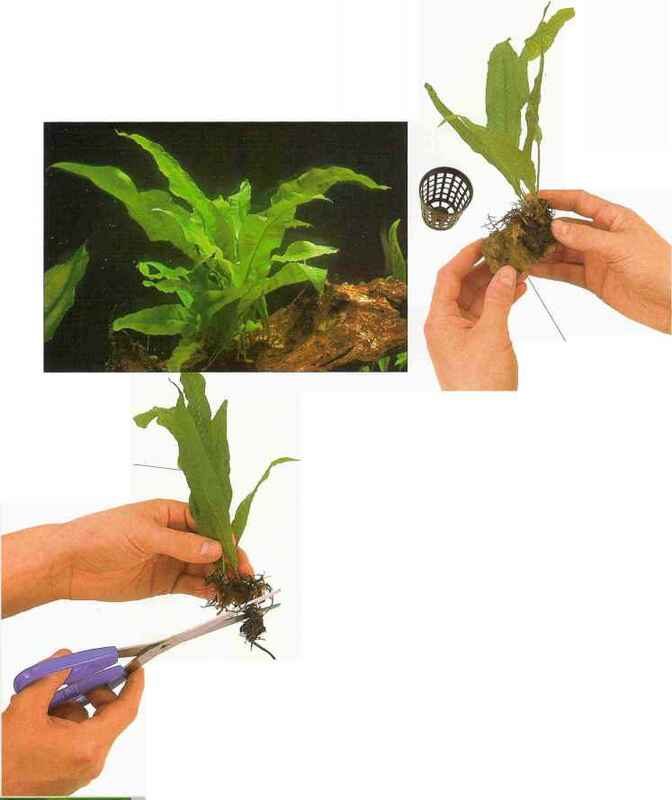 Left: Removing the lead weight from this vallisneria produces five individual plants, each with healthy roots. Plant them separately, leaving space between them to allow for growth. Ludwigia palustris, an attractive and versatile aquarium plant. 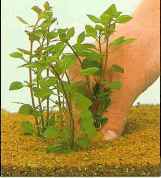 1 Ludwigia palustris I is usually sold as cuttings embedded in rock wool with a little root growth. The plant, with rock wool, should slide easily out of the pot. 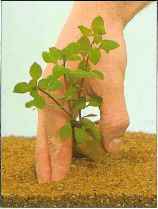 If there are developed roots embedded in the rock wool, leave the plants grouped in the wool. For the best effect in the aquarium, place the separate groups close to one another. 2 Carefully unravel the rock wool. There may be as many as three separate pieces of rock wool, each containing two or three individual plants. 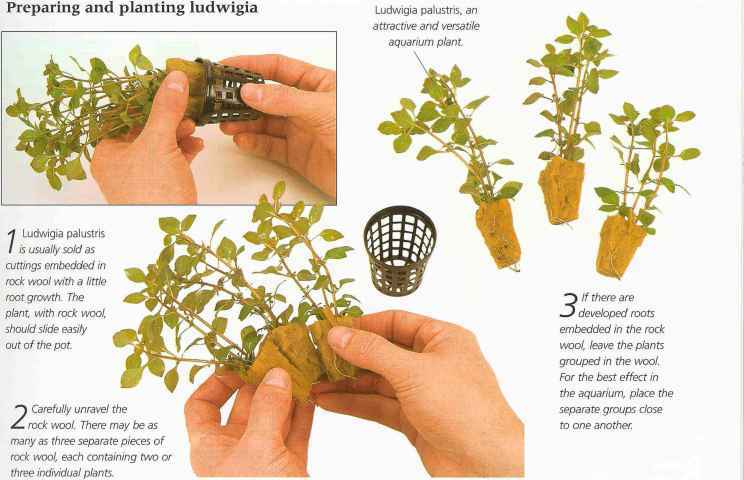 4 Supporting the plant lightly, use your fingers to create a dip in the substrate and hold it open. Try to disturb the substrate as little as possible. 5 Place the roots, embedded in rock wool, into the substrate. Push the plant down until the top of the rock wool is just below the surface. Use the remaining substrate to cover the surface of the roots and compact around the base, just as you would with a terrestrial plant. 7 Place the same plants close together. Here they are 7-2 in (2.5-5 cm) apart. Alternatively, leave room so the tips of leaves on separate plants just touch. 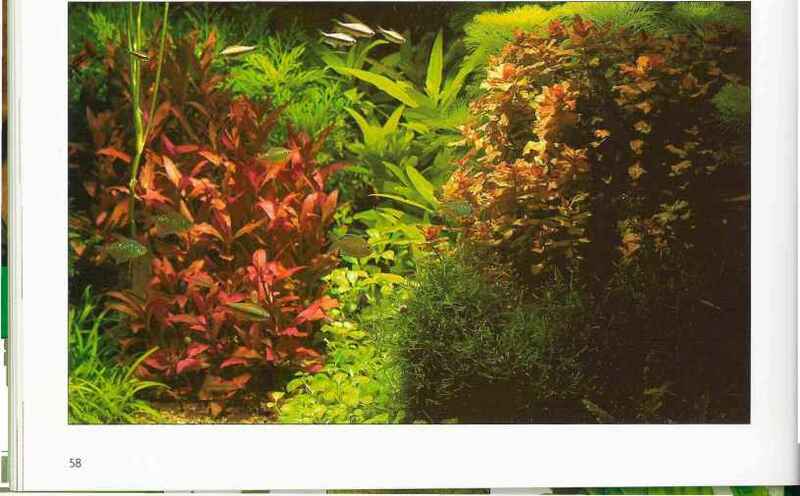 If there Is room, add other plants, such as dwarf anubias and Java moss. Some aquatic plants, including Java fern (below), prefer to be planted on objects such as wood and porous rocks, rather than in the substrate. Many of these "object-rooting" species will also grow, at least partially, out of water and can be raised to the upper reaches of the aquarium and allowed to grow through the water surface. Always choose specimens with healthy leaves, as they grow away more quickly. Try not to keep the plant out of water for too long. 7 Removing the rock wool from Java fern can be tricky, as the roots are often dense and tangled. However, with a little care, any plant damage can be limited. 3 Set the plant on the wood in a natural position. Tie the root firmly but gently to the bogwood with black thread, which will be hardly noticeable and soon covered by new roots. 2 To minimize damage and encourage regrowth, trim any excess root with sharp scissors, leaving 0.4-0.8 in (1-2 cm). Take care not to cut or damage the rhizome (the main root). Right: Place fertilizer tablets under or close to the roots of individual plants. This new addition to the tank will soon be able to absorb the nutrients. A few common aquatic plants are better suited for planting on porous rocks and/or wood rather than in the substrate. Typical examples include Anubias, Microsorium, Vesicularia, and Bolbitis species. They are often sold as potted plants, so take them out of their containers and carefully remove any rock wool. 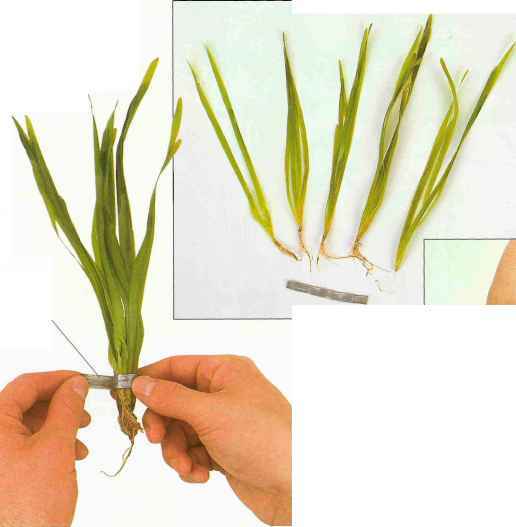 Trim the roots to about 0.4 in (1 cm), but make sure you do not cut into the main root, or rhizome, from which the leaves and stems are produced. 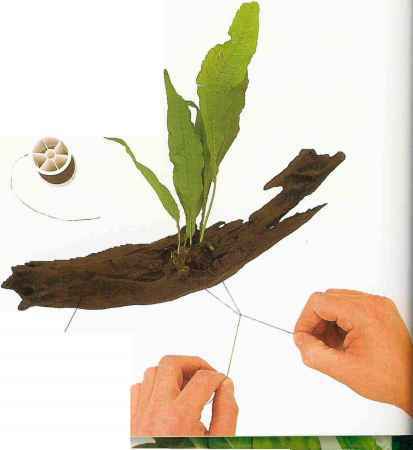 Tie the rhizome firmly in a few places to a suitable rock, piece of wood or other item, using black thread. The thread will slowly degrade as the plant roots onto its support. When putting in the first aquatic plants, leave space between them for growth and propagation. Most stem plants should be planted at least 2-4 in (5-10 cm) apart to allow room for the leaves to grow without blocking out light to the foliage of their neighbors. This will also give you space to plant top cuttings at some future date if you wish. Many foreground plants reproduce by means of runners. Allowing existing plants to grow and spread naturally often creates a more realistic effect than filling the foreground area with new plants. Plants that develop from runners in the aquarium are often healthier and better looking than the parent plant, so allowing them plenty of space to grow will result in an enhanced display when the aquarium is fully established. Below: Move large plants, such as some Echinodorus spp., with care. First remove any very large leaves and trim the roots. This prevents damage to the roots and means that the plant will not require large amounts of nutrients when it is replanted. their first few weeks in the aquarium. Liquid fertilization is not vital during the first week or two and should be avoided to prevent encouraging algae to form. Nutrient-rich capsules or tablets placed in the substrate are ideal for encouraging root growth in new plants, particularly species that are harder to keep or do not adapt easily to living in aquarium conditions. These tablets can be placed directly beneath new specimens when they are planted, giving them an immediate source of nutrients just beneath the roots, which will soon grow around the tablet. The procedure for moving and replanting an established plant is much the same as for planting a new one. The only difference is that the root growth is much more widespread. The roots should still be trimmed, but only to about 1.6-2.4 in (4-6 cm), and older or damaged leaves should be removed. If the plant has a number of large leaves (as is often the case in larger Echinodorus species), remove the biggest ones before replanting. 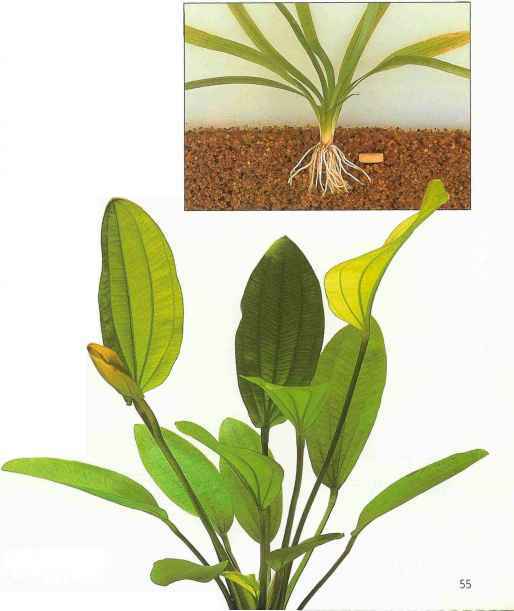 This reduces the plant's nutrient requirement and encourages new leaf growth. Light in the infrared area (700-750 nm) cannot be used by plants. Sunlight peaks in the blue area of the spectrum. This shortwave light is used by both plants and algae. Green light is reflected by the majority of plants. 350 nm and at the "long" end Is infrared light (700-750 nm). Different light sources produce different light spectrums depending on the strongest wavelengths emitted. For example, a light that appears blue produces more light at the lower (400-500 nm) end of the spectrum, while a light that appears red produces more light at the higher (650-700 nm) end of the spectrum. 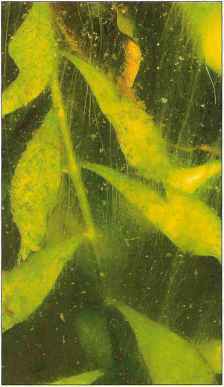 Aquatic plants' photosynthetic ability is most sensitive to red light between 650 and 680 nm. As we have seen, plants use light to photosynthesize - a vital process that allows a plant to create its own energy (food) reserves (see pages 12-16). Without sufficient light, photosynthesis will be impaired and plant health will diminish. Providing a suitable light source, combined with good environmental conditions, will ensure that plants are able to photosynthesize at an optimum rate and remain healthy. In most aquariums, a single fluorescent tube is the norm, but unfortunately, this fails to meet the light requirements of many plants. Correct lighting in general is an area where many aquarium plants suffer. To provide the correct light source for aquarium plants it is important to understand how plants use light in nature and what qualities light possesses. Right: Bright lighting is essential for many plants, although only a small portion of the overall light is used for photosynthesis. The blue and red zones of the spectrum are the most beneficial. 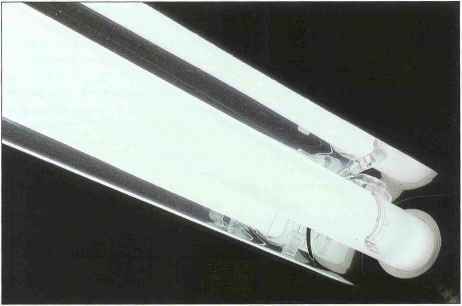 Above: Fluorescent tubes emit light in all directions. Using a reflector can redirect light into the tank and significantly improve light intensity. These reflectors are made of mirror-finish flexible plastic or polished aluminum. Below: Incorrect lighting is one factor that can influence the growth of algae in the aquarium. Varying the intensity and duration of the tank illumination can help to resolve the common problems caused by algae. the other colors of the spectrum are absorbed. This is why the sea appears blue - because blue light is energetic and less readily absorbed by water. Plants use only some of the light they receive, concentrating on specific areas of the spectrum and using only certain wavelengths, usually those that are most readily available. As light passes through water, its intensity decreases but some areas of the spectrum pass through water more easily. Shorter wavelengths of light are more "energetic" than longer wavelengths and it is the more energetic light that is able to pass through water more quickly. Less energetic light passes through water slowly and is quickly absorbed, so it is not much use to plants submerged at a significant depth. High-energy light with shorter wavelengths (blue and ultraviolet light) is not as quickly absorbed, so plants are more likely to receive greater quantities of blue light than red. The photosynthetic pigment chlorophyll, used by the majority of plants for photosynthesis, "traps" mostly blue and red light, although it is most efficient at trapping red light at around 650-675 nm. Blue light is used just as much as red light simply because it is far more available, is stronger in natural sunlight, and passes through water more easily. In the aquarium, artificial light should peak, ideally, in the red area of the spectrum although this can produce an undesirable appearance. Artificial light with a strong blue and red spectrum is often much more appealing to our eyes and will still provide the plants with suitable light. It is worth remembering that strong blue light will also promote algal growth, so aim for a balance of red and blue light. brown or red leaves. 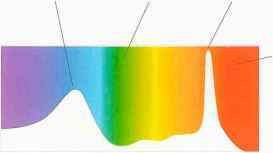 Because we understand the light spectrum, we know the natural intensities of sunlight and which wavelengths (colors) pass through water more easily. We also know that the color of an object is generated by the light reflected from it (i.e., not absorbed). Therefore, we can work out which wavelengths are used by plants and the efficiency of photosynthesis within them based on the color of the leaves. Light green leaves Because white light is made up of many different colors, a lighter color indicates that less light is absorbed across the entire spectrum (i.e., more is reflected). A plant with light green leaves is therefore likely to be less efficient at photosynthesis and lacking in the photosynthetic pigment, chlorophyll. Light green plants are likely to require bright light to compensate for a lack of chlorophyll in their tissues. Dark green leaves Dark green leaves are a sign that the plant absorbs less green light compared with light from other areas of the spectrum. This indicates an abundance of chlorophyll (because more green light is reflected). An increase in the amount of chlorophyll in the leaves allows the plant to take maximum advantage of a given light source. Dark green plants are adapted to grow in low-light conditions and will not require bright lighting. When dark green plants produce new leaves, these are often much lighter in color, because the large amounts of chlorophyll present in mature leaves have not yet developed. Red leaves The red part of the spectrum is usually the area where plants are most photosynthetically sensitive, although in red-leaved plants this light is reflected and not absorbed. The change in color is due to the fact that the plant is using a less efficient carotenoid pigment to trap light energy than the usual "green" chlorophyll pigment. To compensate for the lack of available red light the plant must receive greater quantities of blue and green light and thus requires brighter lighting in the aquarium. 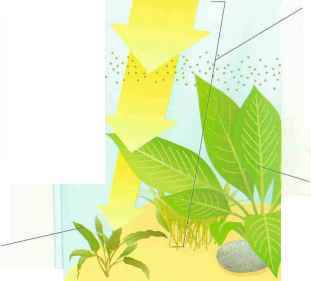 Some plants can change the pigment used for photosynthesis depending on light conditions. In this case, red-leaved plants will turn green if the lighting is not adequate, and some green-leaved plants will produce red leaves toward the top of the plant (i.e., closer to the light source) or in overall bright lighting. Aquatic plants are found in virtually all freshwater habitats, the majority of which are river systems. A typical river has many different stages and the light that plants receive depends on their location within the river system. Near the source of the river, the surrounding environment is often open and lacking in vegetation, so sunlight is available at full intensity all day long. The same occurs much further down the river where it often travels through open plains. Many tropical rivers, however, flow through areas of dense vegetation and a significant amount of sunlight is blocked by overhanging trees and bushes. Aquatic plants are generally found near the riverbanks of medium-sized to large rivers where the water is shallower and the plants can obtain light more easily. Below: A contrasting mixture of leaf colors can look very attractive in a planted aquarium, although the lighting must be tailored to the needs of the different plants. In tropical regions, plants will receive about 10-12 hours of strong light every day for most of the year. The most intense light occurs during the middle part of the day. During dawn and dusk, there is a gradual change in light. How to i attach moss to bogwood? How can i attach java fern to bog wood? How long can i keep mail order aquarium plants in their bags before planting? How to plant aquarium plants in gravel fingers or or? How are plants grouped images? How to plant aquarium potted plants? How tie tie rhizomes to wood? How to plant java moss? How to trim aquarium plants? How to grow moss in aquariums? How to attach plants into aquarium? How to overcome on algae on aquarium plants? How to prepare plants in aquariums? How to identify aquarium plants? How to plant aquarium plants in ceramic pots? How to attach plants to wood in aquariums? How to bunch aquatic plants? How to prevent Aquarium Evaporation? How deep to plant aquarium plants?